19 Sep Death of Bishop Clarence A. Kopp, Jr.
Dr. Clarence A. Kopp Jr., who served as a United Brethren bishop 1981-1993, passed away on Monday evening, September 17. He was 80 years old. Bishop Kopp began his ministry as the first associate pastor at King Street Church in Chambersburg, Pa., working under Dr. Clyde Meadows. He went on to serve several UB churches in Ohio, including Prescott Avenue (now Lighthouse Community) in Dayton and Redeemer (now Living Word) in Columbus. 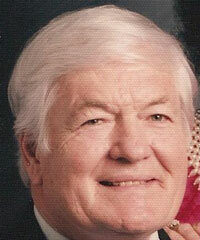 He was pastoring Redeemer when the General Conference elected him bishop in 1981. Bishop Kopp graduated from Huntington University and its seminary, and earned a Doctorate from Trinity Evangelical Divinity School. Bishop Kopp is also past president of the World Society of Christian Endeavor. A series of training events for laypersons will be held in five different locations during September and October. They are designed for anyone serving in some type of local church ministry. The training will include principles that can be applied to any size church and to any segment of ministry. A number of denominational short-term mission opportunities are planned for 2008. They are listed below. February 15-29: Medical Team (6 persons) to Mattru Hospital, Sierra Leone. April: Evangelistic Team to the Philippines to assist with a crusade. June 4-14: Ministry Team to Peru, working with Anna Geivett and Food for the Hungry. June 20-28: Medical Team to Copan, Honduras. Summer: China Teacher Training Trip. June-July 3: Impact Poland (for teens). 2008: Construction Team to Haiti. On Sunday, September 2, Eden UB Church in Reedsville, Ohio baptized five people in a service at the Lake of Forked Run State Park. This was Eden’s first baptism in quite a while. The people included a convert from last year, a 10-year-old girl who made her profession of faith, a young man who was converted a few years ago, a newcomer to Eden, and a re-baptism of another woman. The baptism has seemed to revive the congregation, which has had its share of difficulties. Several people have since expressed interest in being baptized and others in the community have started to express interest in Christ and the Church. The Pastor of Eden UB is Pastor Adam Will. 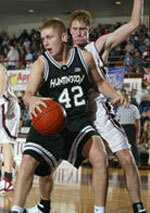 Alex Kock, a 2007 Huntington University graduate, has contracted to play professional basketball for BC Mess, a team in Luxemburg. This is the first time a former Forester has been signed to a professional team. Kock, a native of Auburn, Ind., left for Europe on September 8, and will play through April 17. In 2007, Kock was named Division II National Player of the Year by the NAIA. In HU’s own Mid-Central Conference, he was named Player of the Year for three consecutive years (he played his freshman year at Wright State University before transferring to Huntington). As a senior, Kock averaged 23.4 points and 10 rebounds per game. Read more about him. Huntington University’s has launched the Urban Scholarship and Mentoring Program, which will identify and support up to six urban students each year in a scholarship, mentoring, and urban leadership program. This start-up initiative is made possible by an $18,000 award from the Ball Brothers Foundation Venture Fund. This program involves a partnership between Huntington University and Youth for Christ. The first scholarship recipients will enroll in the fall of 2008. The 2008 U.S.News & World Report annual collegiate rankings lists Huntington University 7th among the Best Baccalaureate Colleges in the Midwest region. Huntington also ranked 5th in the Best Values category. This ranking is based on the percentage of students receiving need-based grants, the average cost of tuition after receiving those grants, and the average discount from the total cost. “The cost component has been a result of working hard as a campus to keep recent tuition increases well below the average for other colleges and universities to impact the sticker price while also offering increased financial aid to positively impact the net price that students actually pay to attend Huntington,” says Jeff Berggren, HU’s Vice President of Enrollment Management and Marketing (right). Tuition for fulltime undergraduates increased just three percent for the 2007-2008 year, the third consecutive year for low or no price increase. That compares to an average 5.9 percent increase nationally at four-year private colleges. About 90 percent of Huntington University students receive financial aid in the form of scholarships, grants, loans or work-study assistance. 11 Sep Interested in Partnering with Nicaragua? Juan Pavon, Superintendent of Nicaragua Conference (right), will come to the States in early November. A group of people interested in partnering with Nicaragua Conference (and also with our churches in Guatemala and Costa Rica, which are extensions of Nicaragua), will meet with Rev. Pavon on November 3 at the UB Headquarters in Huntington, Ind. The meeting will last from noon to 2 pm, and will include a free pizza lunch. If you’d like to attend, please email Jeff Dice.